Various configurations of limestone, gravel, sand, concrete and other blended or crushed materials, sourced from the business’ wholly-owned quarry facilities in the region, are included in these figures. Importantly, these statistics discount the continuous stream of concrete being delivered to the project, further reinforcing Mick Georges contribution to the highway upgrade works. While the one-million-tonne figure is impressive, the positive consequences it represents are of equal significance. The volume equates to 51,625 lorry movements of imported materials which, as you would expect, have considerable environmental impact. This was an important factor initially in the selection of a local company to fulfil the tender, as the contractor’s proximity to the scheme reduces the distances travelled, thereby decreasing carbon emissions. This milestone is also an achievement for Mick George Ltd and the company has received a further boost by virtue its association with the project. 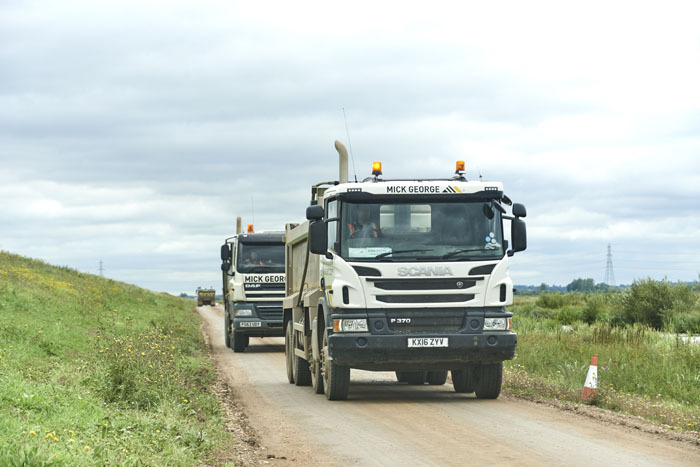 In a recent ‘360 Key Performance Indicator’ (KPI) review by senior representatives of the A14 Integrated Delivery Team (IDT) Mick George Ltd was accredited with an impressive score of 86 / 100 for their concrete, aggregate and waste management supply to this £1.5bn scheme. The score represents a dramatic increase of the level attained at the last appraisal and is around 11% above what would be expected by the project leads. The project is now in full production across all 6 sections. The half-way point, marking two years in construction will be this November and the scheme is on target for the new and improved Cambridge to Huntingdon route to open in December 2012.